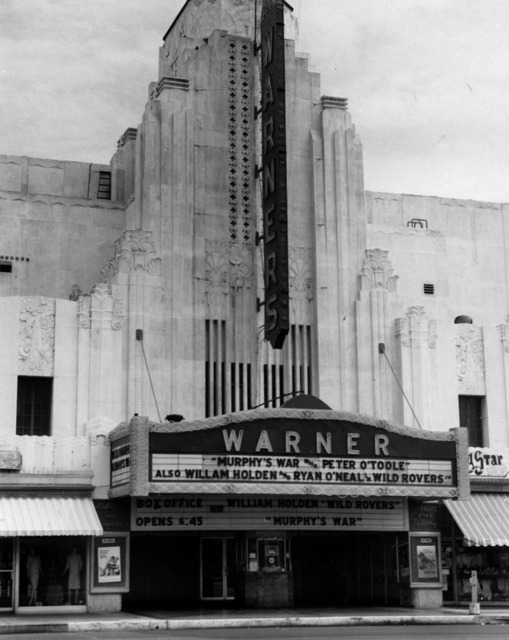 In my last post in this series, I referenced my interview with my younger brother, who was the senior projectionist back when I began working at the Huntington Park Warner Theater. Now that we are both in our late 50’s, and married with children, it was interesting to note his experiences working there and how clear and vivid his reflections were toward that similar stint in his work life. As well, it was striking to realize the parallels in our two, concise projectionist careers. Previously, I thought he worked there a good while, especially before I arrived. In fact, it only seemed long. He only started working there the year before I did, in 1975. When initially asked how long a stint his employment as a projectionist at the HP Warner Theatre, his answer was short. “I believe it was 12 to 15 months, total.”, he said. That was about the length of my term there — he 1975-6, and me 1976-7. The senior projectionist that trained my sibling wasn’t even there that long before he then left. The rate of replacement in personnel during this period was high, to say the least. Well, that made me feel better — I wasn’t the only one treated that way. Or maybe not, come to think of it. Perhaps the others, when they left, went on to better paying jobs…sooner than me. Great. But when I asked one particularly question, my brother’s answer had me a little dumbfounded. Among the common experiences, we also shared a very intense and strikingly similar memory. Although each event was months apart, we’d each be alone when we experienced it, and in different theaters. “Well, probably my least favorite story dealt with the owner’s other theater, the one in San Pedro. Since he (the proprietor of both theaters at the time) was depending upon me quite a bit, I had to work a lot. So, I remember having to go the San Pedro theater, and I had never been there before. As what would typically happen (in all of this owner’s movie houses), the theater’s snack bar would close somewhere around 9 to 10 o’clock at night, and they would still have a movie running. The routine would have the last movie run and end late. It would be near the midnight hour, or so. And it was always an eerie feeling because you (the projectionist) would be the last personnel left after the concession stand closed (and those workers left). At some point (towards the end of the movie), you’d periodically have to go downstairs from the booth, into the theater and walk the floors. I mean I’d be the only theater person there for the business. And you would walk around the whole interior (balcony and main floor), checking the doors and such – and prepare for when the movie ended. When, of course, the movie ended, it was your responsibility to safely shutdown the projectors (shutters and arc sub-systems), gather the film in the take up reel, rewind it for storage for the next day’s showing. And then, you’d have to rush downstairs to make sure that everybody was out of the theater, and no one was loitering or doing something they weren’t suppose to. The theater in San Pedro was a larger one (compared to the Warner Huntington Park), and you would have to have a flashlight to go up and down to the booth (especially when the movie was playing and the house lights were down). Imagine yourself the only person there manning the equipment, and you’ve shut off the (last) movie. And all of sudden, it’s kind of weird (feeling) to be there for the first time. All alone, in a big, dark and (seemingly) empty theater. I was already in a rush to get out. The movie equipment was off, and I’m shutting doors and checking locks. And I’m still upstairs going through the checklist of things to do when you’re closing up when all of a sudden all I can think about is getting the HELL out of this place! Now, all of the time my brother was reciting this memory during my interview, I’m reliving the almost exact same experience I had at one time a couple of months into my new occupation. Remember, the newest guys in the booth had the last pick of the work shifts in the week. And those typically were the closing shifts. The strange thing was I had gotten used to doing the closings, all by myself, at the point when my moment came. However, in my case, as compared to my brother, I never got to the end of the movie. The rule was, before you got close to the 2 minute signal for preparing the last movie changeover of the night, you’d head downstairs and check to see if there were any patrons left in the theater. No reason in starting the final reel of the film if there was no paying customer left to see it. Made sense. The projectionist would be the one to do this since the concessionistas were long gone by this time. They’d leave around 10 pm and the theater closed after 11, or sometimes around midnight. When I casually reached the bottom of the lobby’s stairs, I had nary a care in the world. Why would I? It was a weeknight, my studies were all done, and soon my work would be finished. At least that was the case until I re-entered the main walkway of the theater hall. Let me re-phrase: the now completely deserted movie theater. Those people I’d counted earlier, watching the movie just minutes before, were-now-gone. Every single blessed one of them. I stood half-way down the aisle, turning this way and that, looking for someone. Anyone. I even scanned with my flashlight right at the seats searching for them. Gone. And then, I looked up. All the while, that final reel of the movie was just going about its business there on the screen. Playing for no one — or maybe some thing — with me as the lone witness. And that, ladies and gentlemen, absolutely freaked me like nothing else before! I fastest I ever got up to that fourth story projection booth occurred in that very moment. I performed no shutdown procedure, checklist or preparation for the next day’s movie shift. Everything was left as is. All I wanted was to just cut power to the whole kit and caboodle. Begone. If I flew getting myself up those stairs, I was a blur coming down them. The balls of my feet barely registered on the balcony stairs. It seemed I barely flipped the main breaker near the front entrance in my haste as I ran out of the theater as fast as my legs could take me. The chief importance, what it all reduced to, was to get the HELL OUT OF THERE! And it was only when I interviewed my brother for this series did I finally figure something out for the first time. I recalled the next morning, my brother had the opening shift. I fully expected him to rail on me no end when he found out I’d done none of my closing chores. Yet the strange thing, one I didn’t understand then, he never did. No rebuke or reprimand…nothing. I learned here he knew what had happened just by the state of the projection booth because he’d experienced the exact same at one time. He understood that that moment, one he was so eerily familiar with, had come to his sibling the night before. To his credit, for which I am ever so grateful, he had left it at that. What was the film that was playing on the screen at the time, you wonder? No, it wasn’t The Exorcist or any horror film of the sort. It was a revival showing of the 1965 George Stevens biblical epic, The Greatest Story Ever Told. I wouldn’t exactly refer to myself as particularly religious, and have no explanation why the scenes in its final reel, playing before that empty movie house, elicited that response in me. For those reading this who’d care, we showed it in CinemaScope. Wow! Creepy scene and one that I wish would be filmed! Thinking back to old theaters I went to, they are very scary places. To be alone and have the contrast of the biblical scene and you are the only one in the building–gulp! Great piece Michael. I can fully sympathise with this. When I used to work in a cinema, I hated closing up for this very reason, that there was someone lurking around the place. Cinemas can be very creepy places when they’re dark and empty, particularly older, more traditional ones. Yeah, you know it! The dark being so elemental for a movie theater could play havoc with those employed there. Sorry to be so late in my reply, Chris. Many thanks. I think it doesn’t matter who you are, there’s something just a bit unsettling about a place that’s normally crowded being completely empty. Excellent point, Morgan. It’s also why when you see scenes of completely empty cityscapes in movies, they register with the audience, I think. Sorry to be so late in my reply, my friend. Thanks. Spooky stuff, Michael! And what a movie to be showing, too. Oh, yes. Thanks for the reply and being patient with my reply, Eric. Whoah!!! This is sooo spooky, Michael. I don’t think I’d ever survive working as a projectionist, not the ‘actual’ job itself that scares me, but the part about being the only one left in a theater. I’d have serious issue with that, ahah. Interesting that the film was about Jesus Christ, I think I remember reading an interview w/ Christian Bale where he said he was never haunted playing ANY role (even American Psycho), but when he played Christ in a TV movie he said he had nightmares or something during filming. Go figure! Boy, it’s sooo eerie that your brother experienced the same exact thing! Now, what was the film that was playing on the screen at the time when your brother felt he was being chased?? I can see it, especially in this role for Bale. Yeah, this was one of those shared experiences that made an impact. Sorry to be so late in my reply, Ruth. Many thanks. This sounds like a scene from a movie you ought to write. The sequence is creepy and the visual of the vanished audience raises hairs on the back of the neck. Now if we can get another hundred minutes, we’d have a film. I should pitch at Quentin Tarantino! 😉 Sorry to be so late in my reply, Richard. Thanks for the read and comment, my friend.